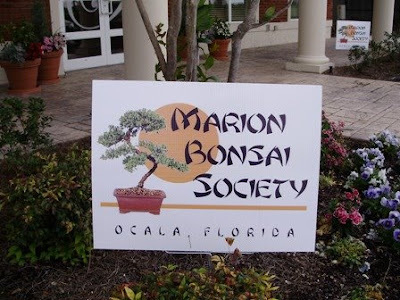 While in Ocala Florida, I visited a wonderful bonsai display that was near the Quilt seminars. I was so impressed with these sculptures. There were about 50 or 60 on display. Most were between 15 and 25 years old. This is definitely a beautiful art. I thought since these don't grow fast or very big, that they would be easy to take care of. But the attendant said most need watering every day since the roots are exposed and most are in such shallow dishes. 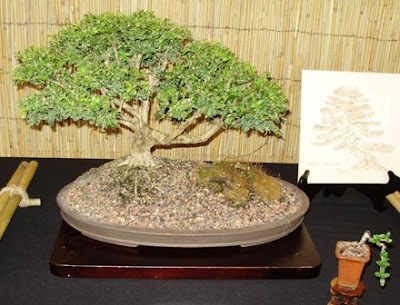 As soon as I saw these, it reminded me that my sister has a wire and jewel bonsai tree that somebody made a long time ago. Does anyone remember doing that craft? 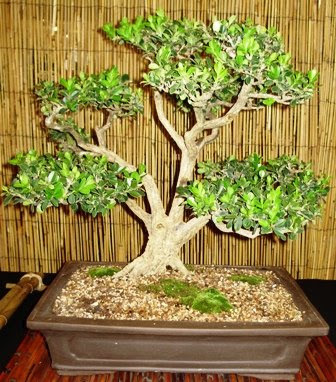 I loved these bonsai but it definitely would not work with our new "retired and mobile" lifestyle. 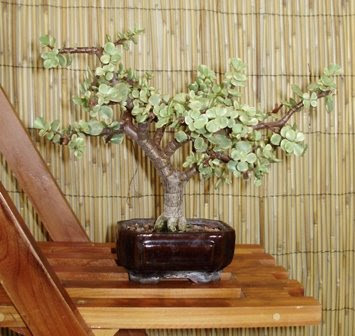 We would have to get bonsai babysitters when we travel. Any of you who have been to a Ricky Tims Seminar knows how I must feel after these past three days. I'm so excited to go home and sew. I really enjoyed all the presentations. There wasn't one that I wouldn't want to see again. I took lots and lots of pictures and I only share a few of them with you today in this blog. I really enjoyed how Ricky explained his piecing methodology to the over 450 participants. He is so funny in his presentation, as is Libby. Everyone loves Alex because of Simply Quilts, but that's gone and she's sick of hearing about it. They are very excited about their "Quilt show Website". These flowers were so whimsical. 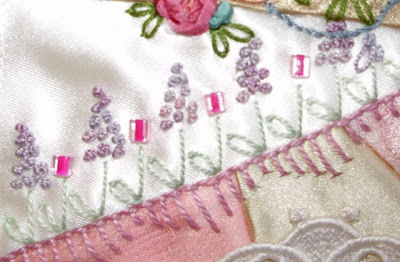 I love the detail of the quilting. Look at this little sea creature. I don't think Ricky intended it to be but doesn't this little guy look like a googly eyed fish peeking out, trying not to be seen. I loved this technique that Libby demonstrated. I would really like to try this at home. 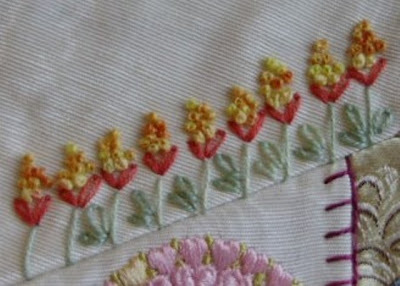 The lines are 9mm wide satin stitch. Beautiful and so effective. 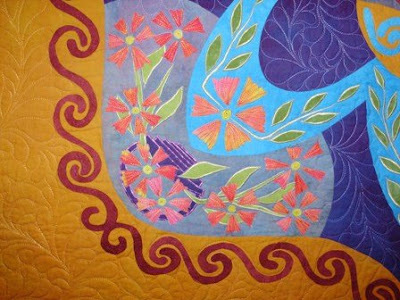 Of the three presenters, I guess Alex Anderson does more my style of quilting. That would be traditional. 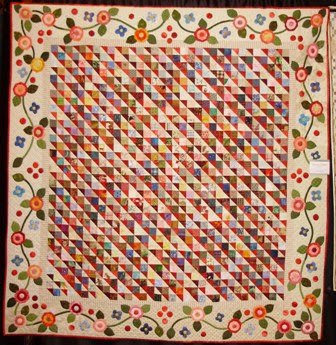 I really loved this quilt with the viney flowery border. I think this must go on my TO-DO list. 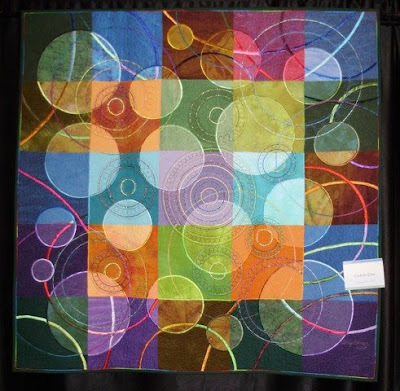 I had a great time at this seminar and will come home with 4 beautiful pieces of Ricky hand-dyed fabrics, thread and perle cotton for me and my friend Linda H. I would recommend this seminar for new quilters and experienced quilters. The other day, I was laying on the deck chair and watching some big puffy clouds go by. I was looking for formations that might be memorable. Maybe even blog worthy. In the clouds I saw some weird looking chickens, guppy like fish and a football. None of the formations were were actually blog worthy... so no pictures I'm sorry to say. I think I was forcing it. But this morning on my walk, I had to do a double take. I saw a fabulous formation in the sand as the tide was going out. Before you look at the picture below, look at the graphic above. My favorite Christmas tree clipart. 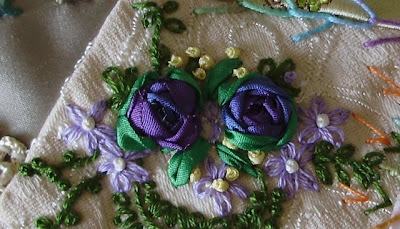 I have embroidery designs like this too. ok. Now you can look at the picture below. Neat, eh! Today marks our 25th Anniversary married. So today is a very special day. We started out our day by going out for a really nice breakfast. We reflected on how lucky we are to have our kids, grandkids, health and each other. It was a very romantic breakfast. 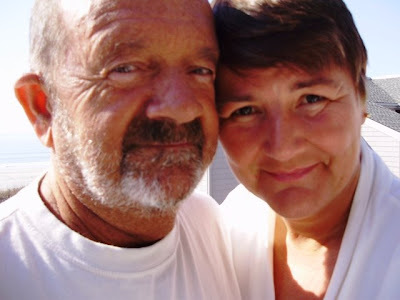 When we came home, I learned how to do the self portrait setting on our little camera. So we played with that for a bit, knowing I had to have a picture of us for my blog. Then, we went for a nice hour long walk on the beach since it's a beautiful day. The minute we got back, the phone rang.. It was a mail call. We had to go pick up something special. 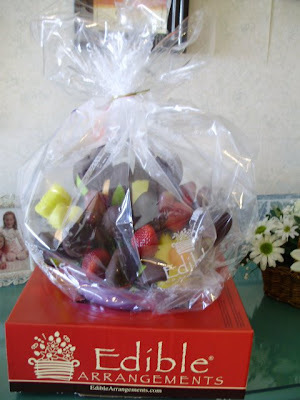 Ohhh, what fun, we hopped in the car and what was waiting for us..... An Edible Arrangement. This is so exciting and everyone at the Real Estate office where we pick up our mail, was so excited for us too! I've never seen one before in person, so how exciting to get one. We couldn't wait to dip into it and try them out. Yummy. It came in a big purple bowl, that I absolutely love. We couldn't wait to dip into it and try them out. Yummy. 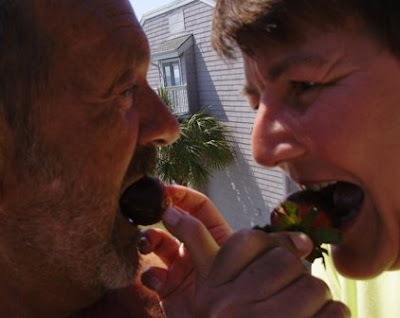 You know, when you get married, you feed each other cake or champagne. 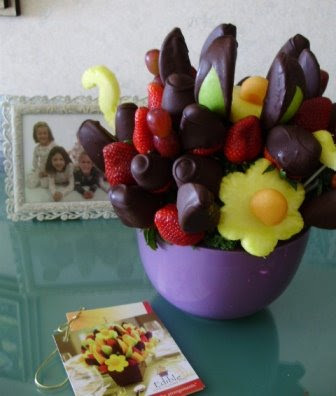 Well, even better than that are big luscious chocolate covered strawberries! Thanks Carrie, Kenny, Michele, Wade, Patience and all the kids. This made our day very special! Do you ever go through phases? I've been through a hand knitting phase. That wasn't fast enough for me, so I went through a 5 or 7 year machine knitting phase. Then I slowly moved into a sewing/quilting phase. That's been ongoing for the past 20 years. I've been back to hand-knitting for 6 or 7 years now, mainly knitting for my darling grandchildren. I don't think I'll ever get back into machine knitting, but I still have 3 beds of needles in case I get the urge. 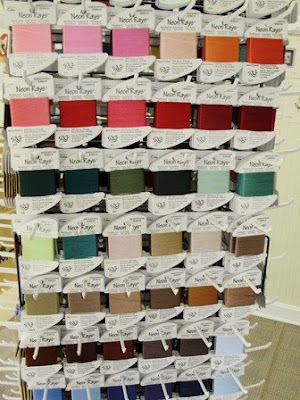 The other day I was pondering buying a silk ribbon book in support of my Crazy Quilting. I didn't get any opinions on my blog. I expect it's because it's a little known book and it's not in any bookstores. I've made my decision to buy the book, as soon as I get home. I have had an order for silk ribbon from Hand-Dyed Fibres ready to place for a few days - I'll push the button next week and my order of silk ribbons should be arriving by mail at the same time as my book. 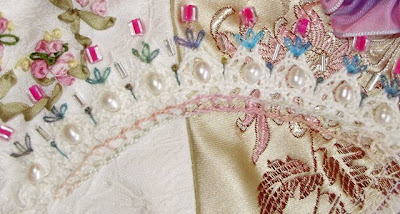 And today I read on Sharon B's site, that she is working on a silk ribbon e-course. I'll probably take that since I'll have a book and lots of ribbon. Now I'll be looking for things to put silk ribbon embroideries on. So that's it. Three things Silk Ribbon. I think it's a sign that I'm just entering my silk ribbon phase. What's next? 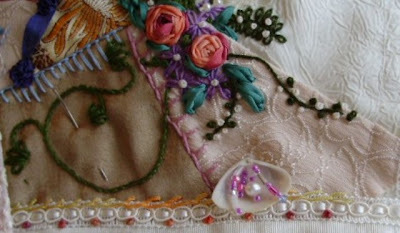 I know that unless you are a crazy quilter, silk ribbon embroidery is probably not your thing. And I don't think it is as popular as it was 20 years ago. I quickly thumbed through this 2005 book "Silk Ribbon Embroidery Bible" by Joan Gordon a few days ago. Then after I got home, I got thinking about the book. I should have spent more time looking at the book. It was a spiral bound book, so it laid flat. My 10 second glance told me it would be worth buying. I say that because it seemed to have lots of pictures of prays and flower arrangements in it. I came home to do a google on this fairly recent book and the Amazon opinions have this book highly rated. 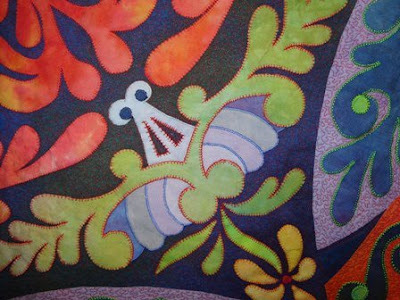 Have any of you Crazy Quilters seen it? I think this is going to be the next book in my sewing room's library. Every day for the past week, the rose bushes are bursting with blooms. 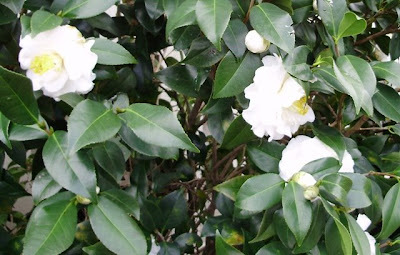 There are puddles of blooms under each bush so I thought, it must be spring here and these blooms will soon be gone. Already the daffodils are done. I always stop and admire this holly hedge on 11th Avenue. It must be 50 feet long. It's so impressive. 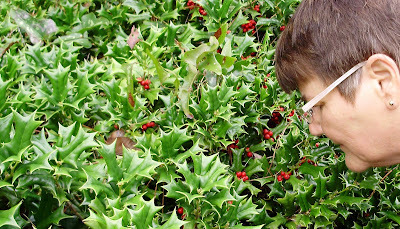 Do you think that holly bushes should smell like Christmas. I smelled. Well, they don't smell like anything. And I would think that we should be able to grow these in NB. Do we? I'm not sure I've ever seen any of these bushes in our area. The leaves are stiff and very prickly. Just around the corner from the Holly Hedge, there are a couple of ponds.. 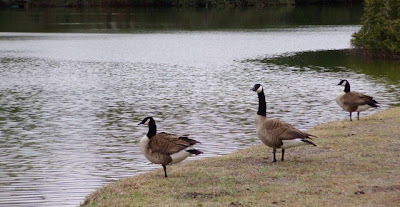 The Canada Geese are still hanging around. Every day, I say, "Time to head north". Obviously, they know better. We'll take our cues from these guys. When we see they're gone, we'll go too. Who can resist a parade in great weather. 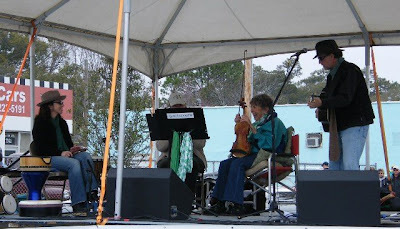 The North Myrtle St. Pat's parade had 120 floats and over 20,000 people attended the parade and festival. Here are some pictures of this great parade. 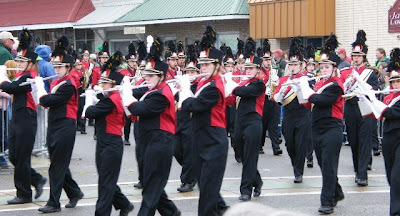 A high school marching Band who were very good at marching in unison, even as they rounded the corner. Great peppy music too. 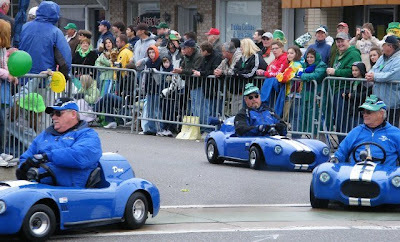 Would this not be fun, to ride these little cars in formations all through the parade. They did figure 8's and other neat maneuvers. 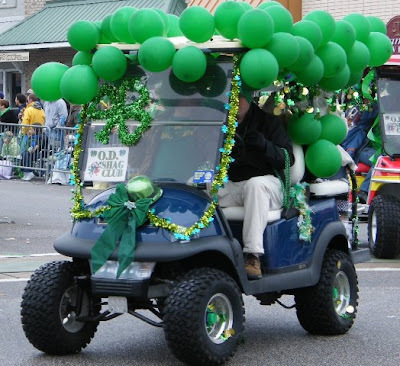 There were many golf carts decorated in Green. Notice the sign, the Shag Club. The Shag is a local dance. Bag Pipers. My friend Jane can confirm, but aren't these Nova Scotia tartain kilts. Everyone clapped along to the rythmic music of the pipers. And what would an Irish party be without celtic music. Gaelstorm from Wilmington, North Carolina. 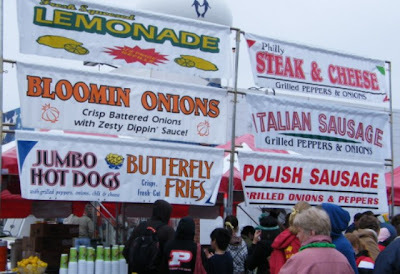 There was lots of food at the festival. This is where we stood in line for half an hour to get lunch. These butterfly fries caught our attention. So here's what we had for lunch. Italian sausage with fried onions and green peppers and of course the butterfly fries. We split this for lunch. Well, we're heading into the homestretch of our stay in Myrtle Beach. While my 2 Christmas socks are only about two thirds done, I love the progress that I've made in the last 4 weeks. It's been a great pass time. This week, I beaded some, then got the urge to do more threads, then I beaded a bit more and decided I needed to do another line of stitching, here and there. So, I didn't get as much beading done as I anticipated. So the lesson here is that I learned that starting to bead will usually bring more stitching to get the final look of the seams. I'm thrilled with how the socks are starting to fill in. Also, a couple of weeks ago, I spoke of my beach searches for a special sea shell to represent South Carolina where I did most of the stitching on these socks. Here is the little shell. I think it's sweet and fits right in. I couldn't quite get the look that I wanted by having the shell side out. So I decided to invert it and add a few beads to enhance it. I really like it. As promised, here are some lines of beading and a couple of lines of stitching. I'll be working on the socks for another week, then putting them away until after we get home in April. I was at a street festival yesterday celebrating St. Patrick's Day. I won't post the St. Patrick's pictures yet. That will be my Mar 17th blog. 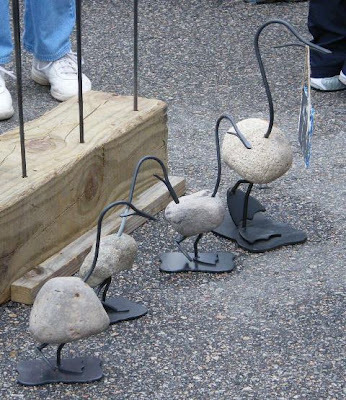 But one of the items at the festival that was for sale, were these hand crafted ducks. The bodies are large stones. The feet and head are wroght iron. Wouldn't a set of these look great at the cottage? Now these put a smile on my face. What a great day today. It's not the sunniest day, and a bit on the cool side. About mid-morning Mert said, let's go to North Carolina for a drive, and off we go. We head into a small town called Southport. It's a seaside community with many quaint gift shops and restaurants. As we drove by this needle arts store, I did a double take. I was surprised to find it here since a much bigger city like Myrtle Beach doesn't seem to have anything like this. I was thrilled. We started out little tour of Southport at this shop. Angelwing Needle Arts. It has quilting, knitting, cross-stitch supplies and more. I breezed by the knitting since I have enough wool at home to choke a horse. I was impressed by the amount of threads they have. 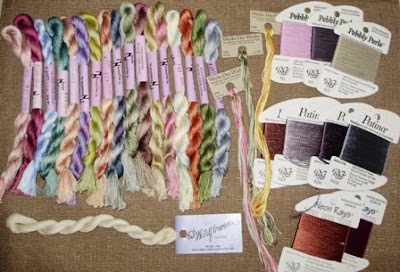 I'm used to buying threads online, so it was so wonderful to see all the threads in poerson. 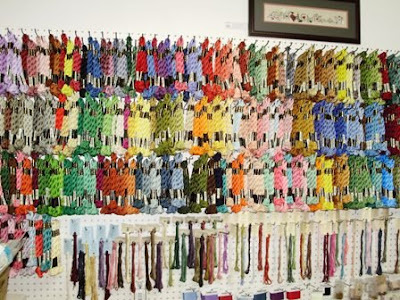 They had many many find threads, ribbons and other stitables. They also had every DMC perle cotton you could ever want. It was a little overwhelming. I was taken care of by Donna Bennet who is the owner operator of the store. She was friendly and very helpful to the visitors who came in while I was there. I wished I had a "wish-list" built for a particular project. I didn't. But alas, instead I purchased some goodies for my stash. So here is my catch of the day at Southport, so to speak. I concentrated on the Needle Necessities flosses since I know that they might be harder to buy in the future. In my stash, I already have some of the RG threads such as Encore, Splendor and Bravo. So today I bought some of the Neon Rays, Pebbly Perle and Patina to try out. I have some Weeks and Wildflowers flosses but you can always use more, right? 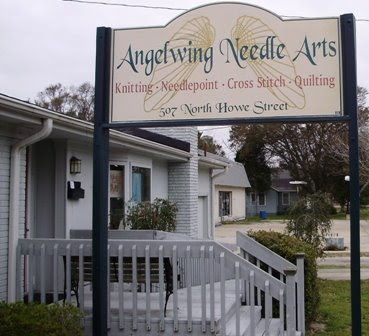 Anyway, I encourage anyone of you in the North or South Carolina area, to stop by Angelwing Needle Arts in Southport North Carolina. Bring your wish list with you. You won't be disappointed. 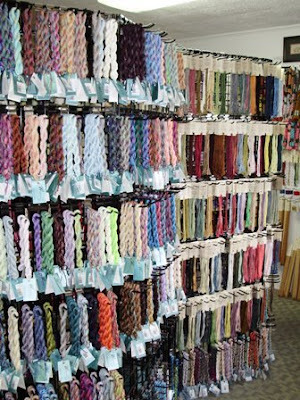 Here are some pictures of the threads, ribbons and beads at Angelwing. Well, it's getting on in the week, and I haven't blogged for a couple of days. We're pretty relaxed down here, and there's not a lot to blog about. I've already blogged about the weather. 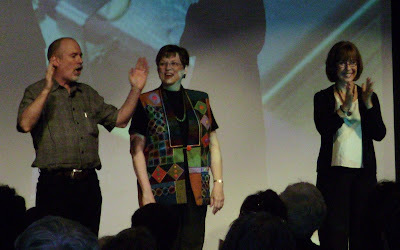 And I've already blogged about our condo, the quilt show and the dolphins. I only blog about my crazy quilting on Mondays, so now what. How about Food? 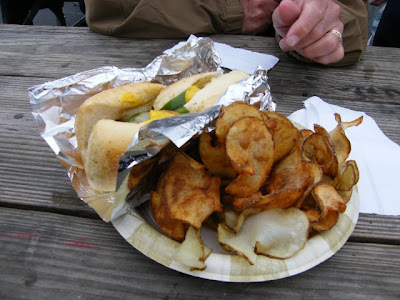 Here is my absolute favorite lunch while in Myrtle Beach. We've been out to a few fast food places that we don't have at home, and even with that, this is still my favorite lunch and we make it at the condo. 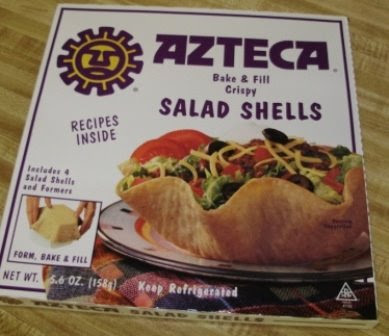 We get these Azteca salad shells at the local IGA store that is about a 5 minute walk from our condo. I've never seen them before except for here. These shells are quite like the deep fried ones, that I used to get when my friend Julie and I would go for lunch at Mexicala Rose's. 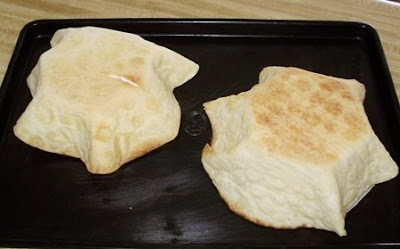 These these are more pastry like and since they are baked, they are less greasy. The best thing about these, is that they are not quite as big. Just perfect for a lunch. Here's how it works. The box contains enough stuff for 4 shells. 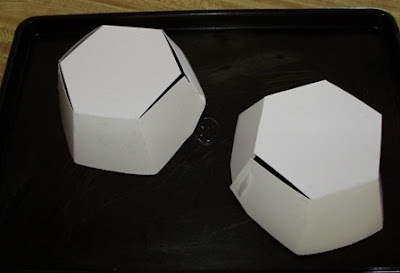 Take the little cardboard forms out of the box and fold them to make an upside down bowls. I'm good at origami, so these are a snap to do. Next, drape the prepared pastry shell over the form and bake for 6 minutes in a 350 F oven. Take out of the oven and let cool for 5 minutes. 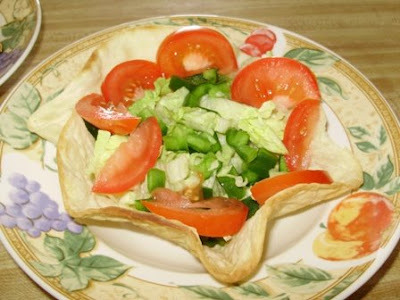 Then Invert onto a dish, and fill with your favorite salad. 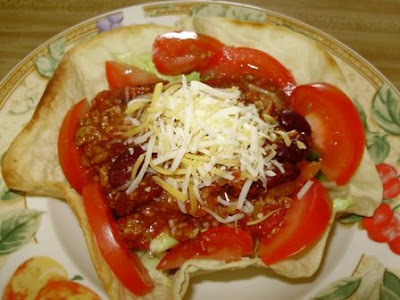 For us, it's a tossed salad with a scoop of chili on top. Much like a Wendy's salad, except half the size. Here is our finished salad with shredded cheese on top. It was yummy. I wonder if any such thing exists in our Sobeys or superstore? If you see some, let me know. This is the north end of our 25' deck at the condo that overlooks the beach. 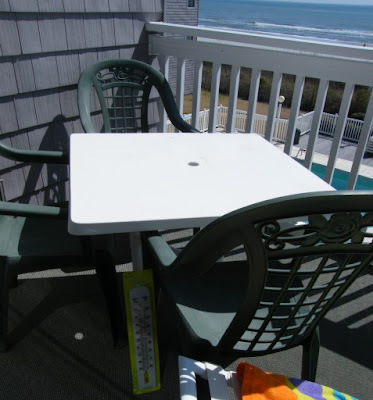 We don't use this table very much, but we do keep a dollar store thermometer under the shade of the table. We are temperature people, you see. We need to know the temp is so we can decide what to wear out for our walk. There are many variables. Long pants, shorts, long sleeves, short sleeve, or jackets etc. 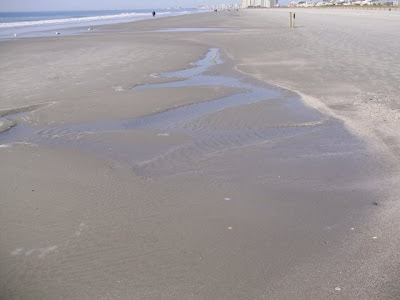 Yesterday was an unusually hot day in Myrtle Beach. I know you all are going to feel sorry for us, but at high noon, it was almost too hot to lay on the deck. Mert was golfing. It was almost too hot for golf. It was 83 degrees on the golf course and 80 at the beach. Today was a more tepid day. 70 degrees at noon and it looks like more of the same for tomorrow. I can't believe we check out of here in 2 more weeks. It's hard to believe that 3 weeks have gone by already and I'm working on silk ribbons already. When I did my first CQ sock last fall, I'm sure I was on week 12 before having the confidence to move on. So, after this week, I have to say, that silk ribbons are so nice to work with. 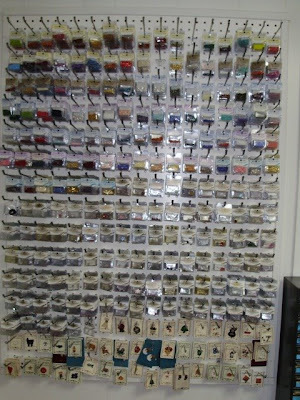 I don't have very many ribbons - maybe 6 or 7 hand dyed ones. I haven't really embellished very many seams yet with these silks. I really liked doing this rouching one. It's one that I learned in my Linda H. class last year. I don't think I've seen this technique anywhere else that I've been browsing. It's quick and very effective. Although, this ribbon might have been a bit dark for the placement, I really like it. It's staying. I really like the floral sprays and I need a bit more imagination when making sprays. In these below, I didn't have a plan when starting out. I just laid down the roses, then worked around them. I like the 5 spoke ribbons. I can't seem to move away from them. I'm trying different leaf techniques. I still need to put leaves on these. I'm not sure which to use. These 3 roses were made from a single cut of 7mm wide ribbon. It's such a coincidence that the color changed for the entire rose in the center. I love the hand-dyed ribbons. More 5 spoke roses. I love the dark color. In real color, they are more purple than blue. This week, along with more thread and ribbon, I'm starting to work on beads, buttons, and shells. I'm anxious to see how the sparkle will add so much to my 2 socks. I'll show you next Monday. Is it a dolphin, or is it a porpus.